Paul L.T. Héroult‘s memory is once more honored in the United States of America. 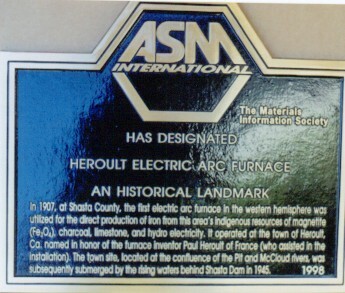 On September 25, 1999, at Shasta Dam in California, and before a group of about 50 people including four members of the Héroult family, a plaque was unveiled to pay tribute to the submerged town of Heroult and to the man after whom the town was named. The plaque is placed in a location where it can be seen by the 100 000 people that visit the dam each year. This event is the direct result of three years of tenacious work by George Binczewski, a researcher in the history of metallurgy . Mr. Binczewski had been corresponding in writing with Paul Héroult’s daughter Elisabeth for many years to gather first hand information on her father’s role in the early development of the aluminum industry. One day she asked him to try and locate the town that was named after her father. Dr. P. L.T. Heroult, Heroult on the Pitt , Baird Post Office, Shasta County, Cal. The past existence of the town was confirmed by Ms. Hazel McKim of the Shasta Historical Society and photographs of the town taken 90 years ago were available. and the Golden Gate Chapter of ASMI sponsored the event with the support of ASM World Headquarters near Cleveland, Ohio. ASM International is the world’s largest society of professionals in applications, research and educational publications on metals and materials. At the plaque dedication and unveiling ceremony which was attended by the Mayor of the City of Shasta Lake and a number of ASMI officials, including the current ASMI President Dr. Hans Portisch from Austria , Mr. Steve Frodge, Chairman of the Electric Furnace Division of the Iron and Steel Society, made an enlightening presentation of the economic and environmental impact of Paul Héroult’s invention on the steel industry (see the attached ). College, Oberlin, Ohio). Christian Bickert of Aluminium Pechiney spoke of the "global" reach of Héroult’s activities almost one century before globalization became a general trend. (Fe3 O4), charcoal, limestone and hydro-electricity. It operated in the town of Heroult, Ca. named in honor of the furnace inventor Paul Heroult of France (who assisted in the installation). The town site, located at the confluence of the Pit and McCloud rivers was subsequently submerged by the rising waters behind Shasta Dam in 1945.